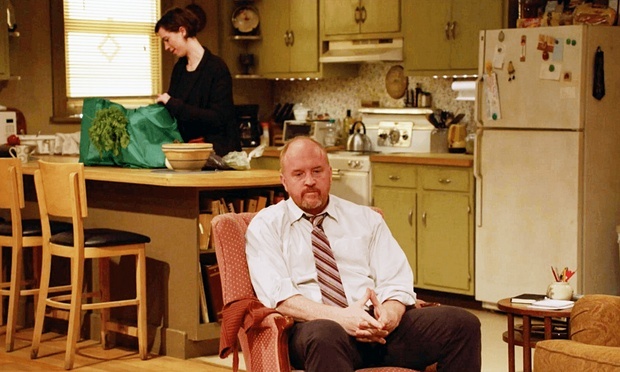 On Saturday Louis CK released a new show on his website with absolutely no fuss or fanfare. For five dollars you can buy the first episode of Horace and Pete directly from CK (over here, if you’re interested). This first episode is sixty-seven minutes long, and the setup on the site makes it look like there might be four in total, but there is zero official information on how many episodes there will be, or even when the next one will premiere. There’s some evidence in this first episode that Horace and Pete was put together very quickly, so the answer to when the next episode will premiere might well be “When Louis CK has time”. CK stars as Horace and Steve Buscemi is his brother Pete, and Alan Alda is a relative they call “Uncle Pete”. Together they run a one hundred year old bar in Brooklyn called, aptly, “Horace and Pete’s”. Comedians Nick Di Paolo and Steven Wright appear as regulars at the bar, as does Jessica Lange, and Edie Falco shows up in the second half of the episode as Sylvie, Horace and Pete’s sister. SNL’s Aidy Bryant has a small part as Horace’s daughter, and Rebecca Hall pops in as Horace’s girlfriend. It’s not a big cast, and there are only two set pieces in the episode: The bar, and Horace’s upstairs apartment. The theme music is an incredibly depressing Paul Simon song. Horace and Pete is sort of like if Cheers was brutally honest about what the regulars at a dive bar are really like—alcoholics—and it has a strong vein of Eugene O’Neill and David Mamet in it. In fact, the show feels less like television, and more like filmed theater. Most of the entrances and exits are through doors—seriously, next time you’re at a play, count how often characters enter and exit by opening and closing doors—and much of the camerawork is static, single-camera shots. There’s a little bit of shuffling with the cameras, particularly early on, that is either deliberate to remind us that this isn’t actually a play, or else this was shot so quickly that CK, who directs, simply didn’t have time to go back and fix things like jiggly takes and in-scene refocusing. Either one seems equally likely. But the staging and the rhythm all screams of the stage. It’s an interesting tone from CK, who is a filmmaker steeped in the visual language of cinema and who has developed a cinéma vérité style on his half-hour series, Louie. The stylistic difference of Horace and Pete is either deliberate to set it as far away from Louie as possible, or else it’s the byproduct of a probably-hasty production (the characters talk about the Iowa caucus and Super Bowl, so it feels like this was shot, like, last week). Maybe both. In the end, though, the result is that Horace and Pete becomes entirely about performance, and CK, who also wrote the episode, has handed everyone some really fantastic material to chew on. Alda and Buscemi get the best parts, playing an irascible coot and mentally ill dependent, respectively. Some of the ideas contained in the episode feel a bit half-baked—Uncle Pete insists he isn’t racist, no matter what he says, because his actions are what really matter, but after the initial conversation establishing that thread, it goes away completely. The first half of Horace and Pete feels like CK dropping ideas to be worked out later, except they made it into the final cut. In the second half, though, the bantering of bar patrons takes a backseat to family drama. Horace and Pete’s sister Sylvie wants to sell the bar, but Uncle Pete doesn’t, even though he technically has no legal claim to it. The theme, at least in the second half, becomes about legacy and how that may or may not burden us. Uncle Pete sees the bar as a proud family heritage, but Sylvie sees it as a legacy of misery she wants to be rid of, and Horace doesn’t seem to care what happens at all. There’s also a bombshell family revelation that isn’t really dealt with by the end, suggesting it may be a thread, like Sylvie’s attempt to wrest control of the bar from her brothers, which will carry into future episodes, assuming there are any. As a one-off whats-it, Horace and Pete is an oddity. It feels both familiar and experimental, and it’s the most dramatic thing CK has produced yet. It’s odd enough in tone and is vaguely preachy on the topics of politics and political correctness, so it won’t be universally appealing. But if you’re willing to try something that I’m not entirely sure we should even call “television”, Horace and Pete is a rewarding experiment.